NEW BLOG CHRONICLES OUR TRAVEL around Rosario Batangas in search of Provincial Boundary Monuments (PBM), Municipal Boundary Monuments (MBM), Barangay Boundary Monuments (BBM) and other landmarks scattered throughout the municipality that are useful reference points for map making and navigation. 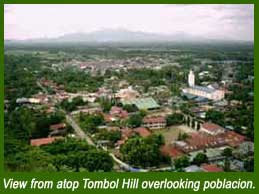 Shortly after that ambush of the Japanese Soldiers in barrio San Roque, Tombol Hill was subjected to mortar attack by the U.S. forces. Then guerrilla elements (some from Cavite) attached to the advance units of the 11th Airborne Division, arrived and briefly occupied the town. A small patrol of U.S. soldiers came in the latter part of March 1945, and set up an observation post on top of Tombol Hill, before the arrival of the main liberation forces. The evacuees, on learning of the developments in the town, started to return home. They were jubilant on the arrival of the units of the 11th Airborne Division and the 1st Cavalry Division. These units met south of Lipa (north of Rosario, in the area of now Padre Garcia) on March 30, 1945. The unit of the 11th Airborne Division was left to mop up the overran area , assisted by the guerrillas. It set up camp in Rosario with headquarters at the residence of Alcalde Gualberto. An army field hospital was put up in the municipal nursery ground. It treated both army and civilian patients. The 1855th Signal Company of the 11th Airborne camped and set up the communication facilities in the burnt Catholic Church premises. The other units were camped around the town — in the plaza, in the burnt market place and in the other open spaces. U.S. soldiers were commonly called "G.I. Joes". On their arrival they were loudly greeted by the civilians: "Victory Joe" with the "V" sign of the hand. G.I. Joes shared their supply of cigarettes with the menfolk; and candies with the women and children. Some civilians were hired to work in the camp as mess hall helpers and tent boys . Some women did the laundry work. They were paid either in canned goods or in Philippine peso. Later, laborers were recruited to work on construction projects and in the base camp in Batangas. The unit of the 11th Airborne Division stayed in Rosario until about 1945, then moved to Mataas na Kahoy. On the reorganization of the local civil government, the U.S. military authorities installed the pre-war officials to their former positions except the alcalde of the town, Dr. Crisanto A. Gualberto. The CIC of the U.S. military authorities arrested Dr. Gualberto on charges of collaboration (a common charge against officials who served during the war). He was publicly displayed in the town plaza as collaborator to the dismay of his town's people whom he had served with fortitude during the war . He was sent to the Iwahig Penal Colony along with Don Claro M. Recto and many other national political leaders of that time . The U.S. military authorities sought the assistance of the Catholic Parish Church in looking for someone to be appointed alcalde of the town. Rev. Father Luis Mortera recommended a very respected resident, Dr. Fernando M. Escano. His family is one of the old and respected families of the town. He declined the honor to be alcalde and instead, he asked for medical supplies to help him open the public dispensary. The military authorities granted his request . Jose B. Zuño, among the highly regarded men of the town, was appointed alcalde. After a brief term of Mr. Zuño, Atty. Jose P. Recto was appointed to be the next alcalde. He was the last alcalde under the Commonwealth Period, and became the First Mayor under the Third Philippine Republic. Author [NB: Conrado T. Reyes] was among those tent boys of the 1855th Signal Co. 11th Airborne Division until their departure for Japan in August 1945. Information provided by Crisanto Gualberto II and added to the author's Chronology of Events, Batikan Souvenir Program 2005. Dr. Escano, Fernando Letter to the Historical Committee, November 11, 1994. Please click on the barangay link for information about its land area, projected population and barangay map.